TOWN centre shops have been thanked for supporting a spectacularly spooky Pumpkin Path trail. 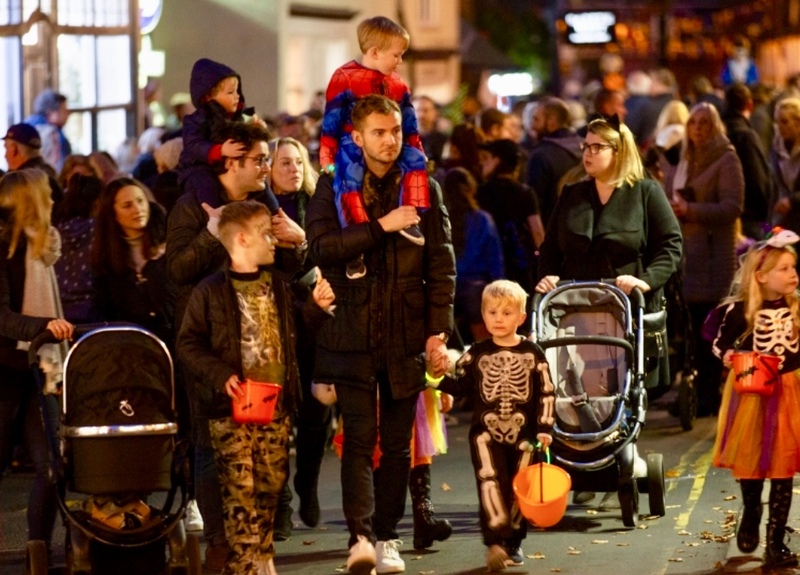 The town centre was packed with spooks and spectres for the popular trail on Wednesday evening, which ran between 4pm and 7pm and was organised by Knutsford Town Council. The event saw youngsters and their parents scour shops and restaurants to find 11 carved pumpkins spelling out ‘Pumpkin Path’ before submitting their entries to the Heritage Centre’s spooky post box. A huge variety of retailers decorated their windows, including Pizza Express, Oxfam, Town and Country, Lockton’s, The OId Sessions House and Zo and Co, and people could vote for their favourite. Sandra Curties, town centre manager, said: “We hope everyone had a lovely time – the weather was really kind, it was really busy and we had good fun. “We would like to thank the volunteers from Knutsford and District Lions and Knutsford Hosts – we had a couple of students from Knutsford Multi-Academy Trust helping out, which was really nice -and our town councillors. 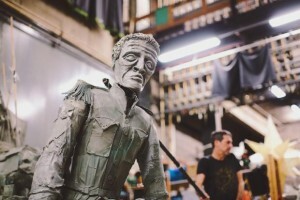 “Thanks to all the retailers – they were so many that really pushed the boat out and did loads of lovely window displays. “We would like to thank you all for staying open in Princess Street, the market hall, Minshull Street and King Street – it was great. Sandra also thanked Event Buddha for organising the traffic management, Greg, Lyn and Craig for the spooky Wallwood characters, local choir Knutsford Beats for entertaining the crowds and Fuchsia School of Dancing. TOWN centre shops are joining in the spooky fun as Knutsford looks to welcome residents and visitors to its annual Pumpkin Path trail. The event takes place on October 31 from 4pm to 7pm, and like last year Knutsford Town Council is organising the trail with many of the town’s retailers and businesses. The event will see youngsters and their parents scouring King Street’s shops and restaurants to find 11 carved pumpkins which spell out ‘Pumpkin Path’ before submitting their entries to the Heritage Centre’s spooky postbox. Sandra Curties, town centre manager, said: “This year is a true community-led event, with dancing provided by Fuchsia School of Dancing, singing from local choir Knutsford Beats, and Tesla will also be making an appearance. “It’s so lovely to see so many shops stay open late and join in, not just the Pumpkin Hosts, and see local – and not so local – families having fun. As well as the shops hosting pumpkins, donated by Jonty’s Fruit & Veg of Knutsford Market Hall, the whole of the community has got involved. A huge variety of retailers will be decorating their windows, including Pizza Express, Oxfam, Town and Country, Lockton’s, The OId Sessions House and Zo and Co.
People can vote for their favourite by completing the entry form on the night, and the top three will be announced by the Mayor the following day. One of the original Pumpkin Path organisers and sponsors, Julia Chard of Mr Simms said: “We are delighted to be sponsoring our sixth Pumpkin Path and supporting businesses with sweet donations to help them with the event. Knutsford Market Hall will stay open on the night hosting traditional Halloween games, mulled wine from Morgan Edwards, face painting by Sylvia from Serendipity and Halloween food from The Market Café. Event Buddha is providing traffic management services, and volunteer groups Knutsford Lions and Knutsford Hosts, plus students from Knutsford Multi Academy Trust, are helping with marshalling, and Tatton Perk will provide hot drinks for volunteers. To enable the Pumpkin Path to take place safely road closures will be in place on King Street at the junction with Church Walk to the junction with Drury Lane, and Minshull Street. There will be parking pay suspension from midnight on Tuesday, October 30 from the King Street junction with Tatton Street to the junction with Drury Lane to enable two-way traffic to enable residents’ access to be maintained. VOLUNTEERS are helping to reduce the problem of loneliness experienced by nursing and care home residents. The first volunteers have enlisted for the Knutsford Hosts-inspired senior citizens’ befriending scheme. 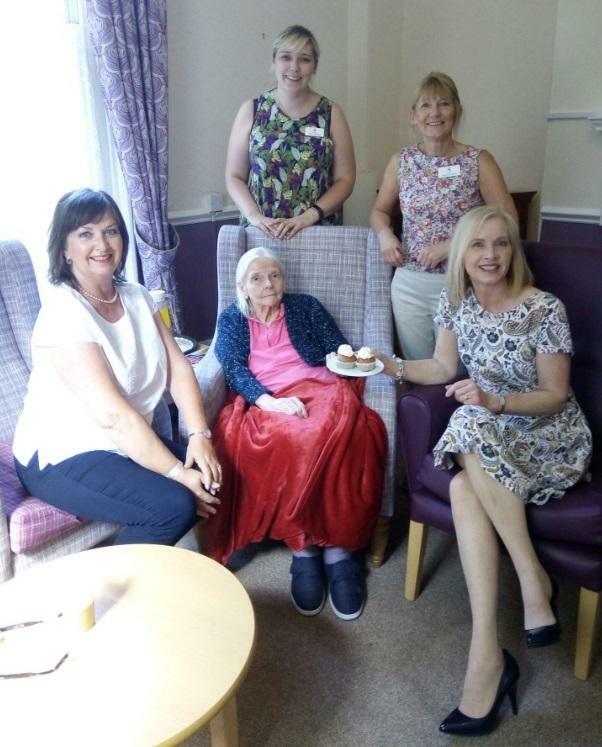 In March the Knutsford Hosts launched a visiting scheme to help address the issue of loneliness for residents of Sharston House nursing home and Sunrise of Mobberley care home. “The idea was simple,” said Sarah Flannery, chairman of Knutsford Hosts. “We wanted to create a pool of volunteers so that both homes receive visitors every week. Get-togethers for the would-be volunteers took place at Sharston House and Sunrise, with the first uptake of volunteers receiving their DBS certificates recently. Stacey Hinton, a Knutsford Host and Sharston House’s activities co-ordinator, said: “Our residents have so much to offer, but many elderly members of our community become socially isolated as friends and family move on or away. Miriam Sala is a Knutsford Host and one of the first to volunteer for the scheme. She said: “I’m really looking forward to befriending some of Sharston House’s residents. “Sharing stories, chatting over coffee and cake and engaging with them will be great. Stacey added: “It’s inspirational to see the Knutsford community pull together to help in this way. Cheshire East & Knutsford Lions – thank you! The Knutsford Hosts is run by volunteers for volunteers as a Community Association. Our overheads are minimal thanks to the generosity of individuals and some local businesses who support us in various ways. One main cost is that of ensuring we hold Public Liability Insurance so Hosts are protected. And thanks to the Knutsford and District Lions Club, that insurance has been renewed for another 12 months. 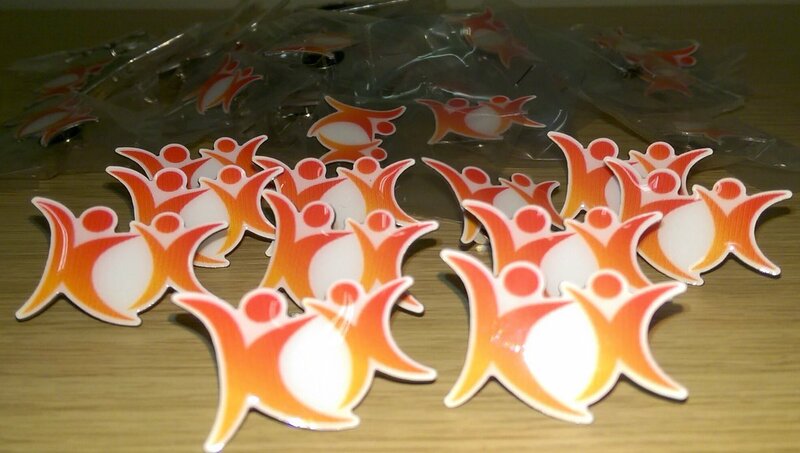 Another main cost is that of manufacturing our pin badges which are presented to new Hosts at our welcome events. 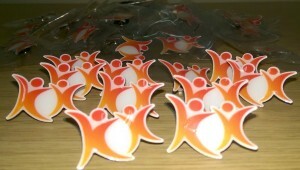 Thanks to a Cheshire East Council Community Grant we have been able to commission a new batch. I WOULD like to say the biggest, most heartfelt ‘thank you’ to the wonderful Knutsford hosts for their massive contribution to Knutsford this year. We now have more than 60 hosts and they give their time and skills selflessly. 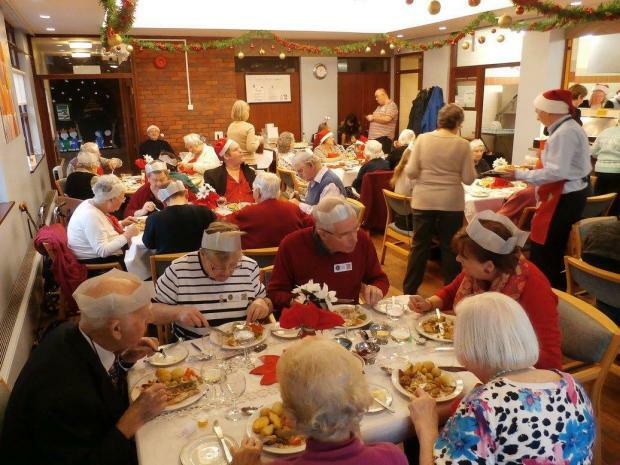 KNUTSFORD came together on Christmas Day to help provide a special festive meal for residents. Knutsford Lions have held the annual dinner for those who living on their own for the past 30 years. The Lions were supported by the Knutsford Hosts at this year’s dinner, with Cllr Tony Dean, Mayor of Knutsford, also popping in to visit. In the run up to Christmas 2015 the Hosts were busy helping Knutsford and District Lions with their annual street collection, supporting the Town Council at the annual Christmas Market and the Tatton Yule Yomp. We also found time for a festive get together for a drink in the Lord Eldon. Lovely comment from one Host about @AdventureFarm: "What wonderful cause. 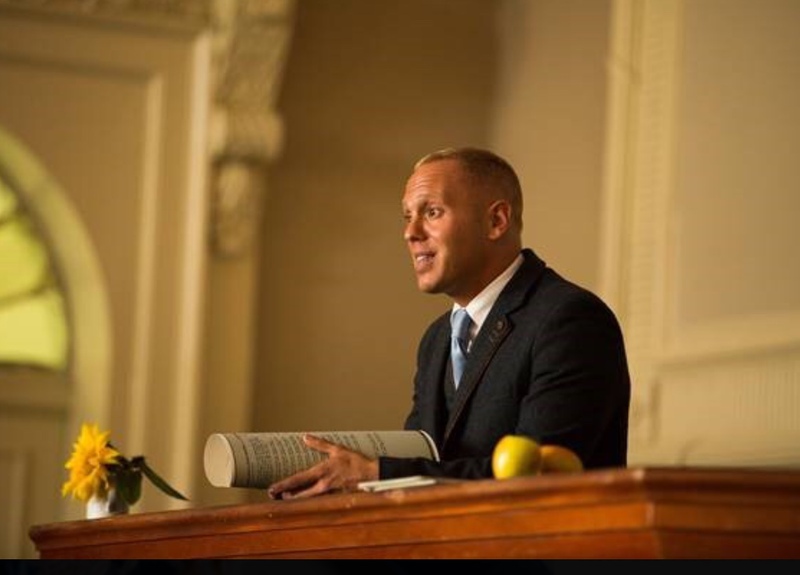 Being a Knutsford Host is a privilege." 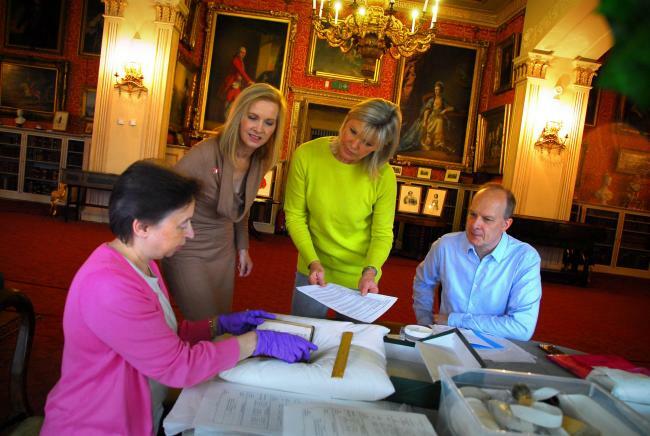 KNUTSFORD Hosts welcomed its newest members at a special event at Tabley House when David Briggs, Lord Lieutenant of Cheshire, presented the badges. “I am delighted to support the Knutsford Hosts”, said David Briggs.